Well I think I’ve got my problems figured out with the Peugeot 50cc Racey Kit. On a whim I thought I’d throw a different pipe on and see how it’d perform. I had a spare RGD pipe that I was planning on using on a liquid cooled project I was saving for this winter. With the new pipe on the kit really opened up. Low end kind of disappeared, but from mid to high the kit rips. I was doing mid 40s without much difficulty. A clutch pulley would fix the low end problem, but I’m going to see if adding another star spring would help out. 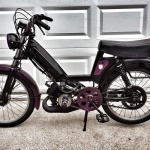 1977mopeds.com Peugeot 50cc Racey Kit Review Part 1 1977mopeds.com Peugeot 50cc Racey Kit Review Part 2 How To Derestrict A Peugeot Simonini Circuit Pipe Got My First Peugeot!